As children’s birthday parties go, for Avi’s party last weekend we stuck to the mundane, predictable basics: pizza, apple juice boxes, and cake—because most kids universally love all three, and parties should be easy AND fun. There were various snacks like vegetables and olives and hummus before the pizza arrived. At the end, I also handed out these cookies. But to kick off the party for grownups (since it’s important that they, too, have a good time), we served this punch. A handful of adults managed to go through almost all of the punch in just under two hours. I call that a punch success. Since the party was late morning to early afternoon (trying to accommodate various nap times and all), I wanted the punch to be light enough as not to derail anyone’s day’s agenda. I wanted it to be bright and effervescent—and full of citrus notes to combat the winter blues. To make my giant block of ice, I froze water in my Bundt pan—it made for a pretty float—and to remove it from the pan, I placed the Bundt, bottom-side up, under hot running water and within seconds, my ice sphere dislodged itself. I tweaked the proportions of this punch, keeping gin amount lower and the sparkling wine—higher since I was serving it in the morning. I also followed the advice of Stella Parks who, in one of her Instagram stories, showed us how to make lemon simple syrup by using squeezed out lemons. It made the punch extra refreshing and impossible to stop sipping. P.S. Stella’s trick is good with any squeezed citrus, and the possibilities for the resulting syrup seems to be endless. Since I’ve learned the trick, I’ve been using the syrup to mix up with hot water, for a delicately sweetened citrus potion. It is both warming and uplifting in our chilly apartment. Halve the lemons across and juice them. You should get 1½ cups (12 fl oz/360 ml) fresh lemon juice. Transfer the juice to a covered container and refrigerate overnight. Meanwhile, cut your squeezed out lemons into smallish chunks and place into a nonreactive bowl. Add enough sugar to equal half of the lemons’ weight and stir to combine. Cover with plastic wrap and let sit at room temperature for up to 1 day, stirring a few times to thoroughly combine the sugar with the lemon pieces. The lemon pieces will give lots of juice – this will be your simple syrup. Strain the lemon simple syrup and discard the lemon pieces. You will need a generous 1 cup of the syrup; if there is extra refrigerate for another use for up to 1 week. When getting ready to serve, in a punch bowl, combine the gin, lemon juice, lemon simple syrup, and bitters and stir until thoroughly blended. Just before serving, pour in the sparkling wine and stir gently. 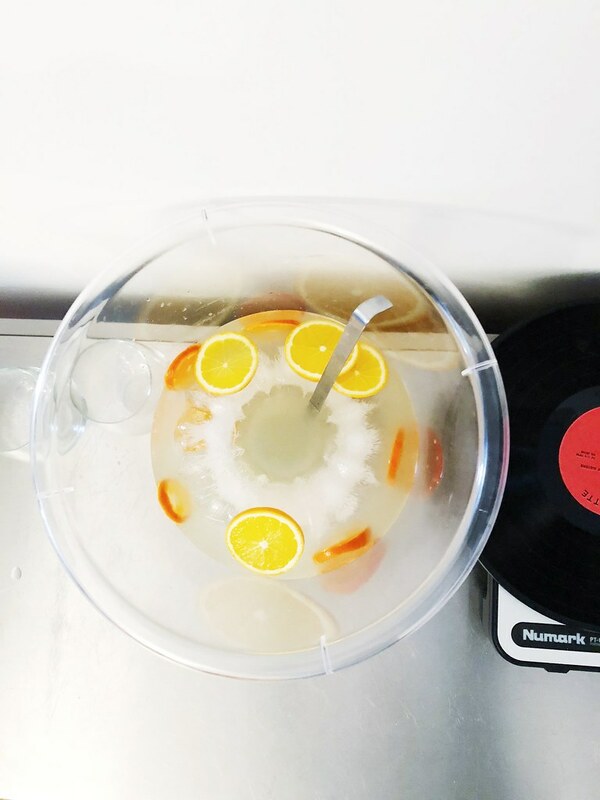 Add the ice and garnish with the citrus wheels. To serve, ladle into punch glasses.